Dymax has the widest range of specialty work tools for wheel loaders and track loaders in North America. Available for Case, Caterpillar, John Deere, Doosan, Hyundai, JCB, Komatsu, Kawasaki, Liugong, Volvo and some we haven’t even heard of! These products range from specialty buckets of all shapes and sizes, to dozer blades, snow plows, quick couplers, material handling arms, specialty block handling tools for granite and marble quarries and specialty rakes. A favorite Dymax Work Tool for loaders is the Dymax Hydraulic Tine Pallet Fork. This tool can be found in nurseries handling balled trees to large storage facilities handling a multitude of materials of varying sizes. Dymax Roll-Out and Push-Out Buckets are found across North America, Australasia and the Middle East handling feeds in large dairies and feedlots. 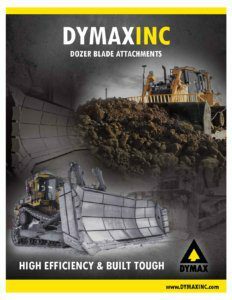 Click below to see the incredible wide range of Dymax Work Tool Attachments for wheel and track loaders.